The Lyle Hess designed Bristol Channel Cutter is truly one of the world’s most amazing sailing vessels! Her cutter rig and heavy displacement hull, mean that she is prepared for literally any weather condition. She is a comfortable to sale in a gale as she is in the lightest of airs. And thanks to rich, warm, interior joinery work below decks, she is the coziest yacht you’ll ever experience at just 28 feet. Reliable, Durable, Safe. Easy to Handle, Great Sailing Performance, Tremendous Storage, Remarkable Craftsmanship!! 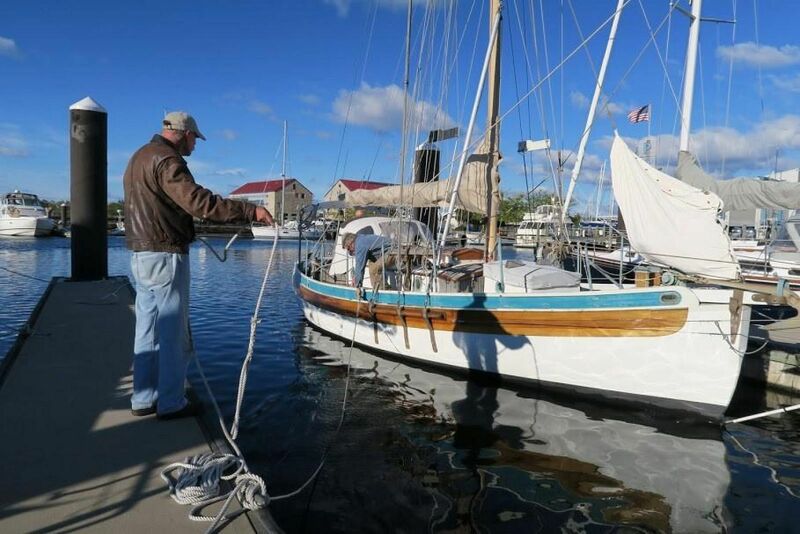 The BCC 28 was made famous by the voyaging couple Lin and Larry Pardey who owned and sailed two channel cutters designed for them by Lyle Hess. They sailed under all five of the great southern capes and crossed the oceans many times. The Bristol Channel Cutter was designed and built for safe passage making and to be easy to handle for a solo sailor or a couple. If you are reading this you undoubtedly are a follower of the BCC 28 and you might still yearn for one of these salty sailing vessels. You likely know that the Sam L. Morse Company built 126 of these over 35 years in Costa Mesa California. However you may not know that about 22 BCCs were built in Canada from the same mold under a license agreement from the Sam Morse Company. These Canadian BCCs were built by Channel Cutter Yachts and most were purchased as a hull and deck kit and were owner completed in the 80s. These Canadian BCCs are truly a bargain as they are the same Lyle Hess design and built equally solidly with a fiberglass hull, encapsulated lead ballast, and overbuilt construction. Because they were mostly owner completed the interior layouts can be unique and often quite beautiful and innovative. Best of all they sell for a bit less making them more affordable and often actually a real bargain. Our special offering “Iduna” is one such Bristol Channel Cutter. Iduna’s hull was laid up by hand in 1979 by Channel Cutter Yachts in Vancouver Canada. Over several years she was completed by Erica and Peter Thinnus with an interior of teak and Alaskan Yellow cedar and rich bronze ports and a teak cabin sole. The boat was not launched until 1983 when she was christened “Iduna” the Norse goddess of eternal youth. It is often the case that people who build boats do not really sail far and after a year, Iduna was sold to a couple who did sail far! They voyaged to Panama from Washington State, transited the Canal and cruised for six or seven years ownership. Again her owners cruised the Caribbean for some years and eventually the boat was sold to a couple from Maine where she ended up in a barn were our friends found her. They had already owned and restored a Pacific Seacraft Flicka and earned for another gratifying project. The Bristol Channel Cutter was their dream boat. They purchased the boat set out to restore and upgrade Iduna. They were incredibly good owners who loved and lavished Iduna of 16 year while cruising very lightly in the Chesapeake Bay. I have fond memories of rowing over for dinner aboard Iduna to enjoy the beautiful romantic ambiance of Iduna’s beautiful interior gleaming under the soft flickering light of the oil lamps and warmed by the Dickinson fireplace all while enjoying Rod’s good cooking! I think that was the best part of owning the boat for them. If you earn for a lovely Bristol Channel Cutter, this offering is a great opportunity. She is the real Lyle Hess BCC that is rock solid and proven. She has many upgrades including radar, a single side band radio and 12 v refrigeration. She is comfortable and beautiful. If you have yearned for a Bristol Channel Cutter, don't miss this opportunity! Iduna is currently down rigged with the mast in storage. The mast was professionally unstepped by Eastport Spar & Rigging, and the boat was otherwise prepared to be shipped. Her holding and fuel tanks have been pumped out, and both the windvane steering and boom gallows have been disassembled to prevent damage in transit. All components have been carefully labeled and stored on-board. If you are in the market for a Bristol Channel Cutter, Iduna is now ready to truck anywhere! You will not incur the costs of getting her ready to truck. Of course she can be easily recommissioned right here on the Chesapeake Bay. A Bristol Channel Cutter is a work of art and if you appreciate fine art and craftsmanship. As you enter the companionway, the large, workable galley is to port, the chart table/nav station to starboard with the famous flip up counter that gives you more space than a forty-foot boat. Just aft on starboard is the quarter berth garage for loads of storage or a berth if you like. Just forward the cozy human sized salon is perfect with the Dickinson marine fireplace heater with a tile surround on the starboard bulkhead. The dining arrangement works really well for four and maybe you can definitely seat six with the leaf. The L-shaped settee to port converts to a double berth while the starboard settee is also a nice sea berth for one. The dining table stows against the bulkhead to make more space for moving about. The forward cabin is the all purpose room with the marine head, sink and vanity with a chest of drawers, medicine cabinet, linen closet and even a shower bag arrangement. The forepeaks area is allocated for great storage of everything from tools, to anchors and rode, and extra lines, and spares, and even provisions for a passage. Access to the chain locker is through a hinged door all the way forward. Opening portlights and a generous opening skylight provide ample light and air, while the warm glow of three gimbaled oil lamps makes the cabin radiate. The teak and Alaskan Yellow Cedar interior is lovely and the joinery is also pure craftsmanship. The teak and holly cabin sole is like a real small ship and the ambiance is simply lovely from another time. It is something to enjoy. This BCC has the largest and most functional galley that exists. You can stow enough provisions for months on end. You have great counter space because of the innovative flip up counter. The galley is located to port, right when you step down the companionway. A deep stainless steel sink holds everything. Cabinets are outboard and there is more counter space under the stairs. To starboard, there is a full-size navigation station and chart table. The famous Lyle Hess designed counter bridges the space creating amazing work space that allows easy access to the refrigerator and to all the storage areas. It is a dream come true and rivals any galley. Use the counter! The BCC has more storage than you can even imagine and more than so many larger boats! It is amazing with the full keel and innovative storage amenities. Great stand up nav station below tidy and neat with cabinets and drawers for storage. The chart table lifts up to provide with plenty of storage for charts, etc. Red LED task lighting is excellent. The navstation includes cubbies for additional storage, and incorporates pen/pencil holders, a compass holder, and innumerable other well-considered storage solutions. Includes Radar, VHF, GPS, SSB. It is totally amazing that this original Sabb diesel powers the boat at 5 knots and you can crank it up by hand if you need to. The engine has been rebuilt with a new cylinder head, new valves, new exhaust mixer and new shaft. It’s awesome. We call in thumper; she’s like a heartbeat! Very friendly engine space with good access! Completely rewired in 2001 with tinned marine grade wire with beautiful breaker panel wiring for the 12 volt system and the shore power. Stout, true cutter rig with keel stepped aluminum mast with double spreaders robust wire rigging with outboard chain plates. Iduna is a Lyle Hess designed Bristol Channel Cutter built from the same mold as the Sam L. Morse BCCs. She was laid up in Vancouver and owner finished over several years to be launched in 1983. The hull is solid fiberglass, hand laid by skilled craftsmen. The deck and cabin top are marine plywood and hand laid fiberglass an inch thick. Her original gelcoat is in great condition. The side decks are very wide, 2.5 feet in one spot. The eight-inch bulwarks ensure safety like a baby's cradle. You feel really comfortable working or playing on deck. The bulwarks are beautiful, constructed by solid mahogany planks slightly raised off the deck, supported by massive posts on 20 inch centers. This means the entire deck is a scupper, guaranteeing you quick drainage in any sea. The entire top of the little forward doghouse opens, making passing sails, an easy job. The forward cabin is designed so that you can easily pass sails up or down or open the large hatch for incredible ventilation below. The cockpit is comfortable, safe and with good coamings around, making for good back rest. Massive sampson posts support the mooring lines and define her little ship. Marine plywood sandwiched with fiberglass about 1 and 1/4 inch thick! 3' Two Paws dinghy (Catspaw) weighs less than 50 lb. constructed of epoxy, fiberglass, Okuma marine plywood and quarter sawn fir.